When you imagine a dazzling, healthy-smile, usually the first thing that comes to mind are shiny, white teeth. But healthy gums are essential, if not the most important part of a beautiful smile. A healthy smile consists of gum tissue that is naturally pink in color, fits tightly around the teeth without periodontal pockets, does not cover the teeth with excessive gum tissue creating a what is known as a gummy smile, and has not deteriorated, often time as a result of periodontal disease, meaning the gums have not worn away as is the case with gum recession. Gum depigmentation, also known as gum bleaching, is a cosmetic periodontal procedure used to remove dark spots on the gums. Normal, healthy gum tissue will typically appear pale pink in color. However, in the case of gum depigmentation, abnormally high amounts of melanin can cause dark spots and patches to appear on the tissue. This discoloration can affect the appearance of your smile and result in decreased confidence and self-esteem for many men and women. At the CENTER for Advanced Periodontal and Implant Therapy, Dr. Aalam and Dr. Krivitsky utilize advanced technology coupled with cutting-edge techniques to perform various periodontal treatments in Los Angeles to restore their patients’ oral health and help them smile confidently again. 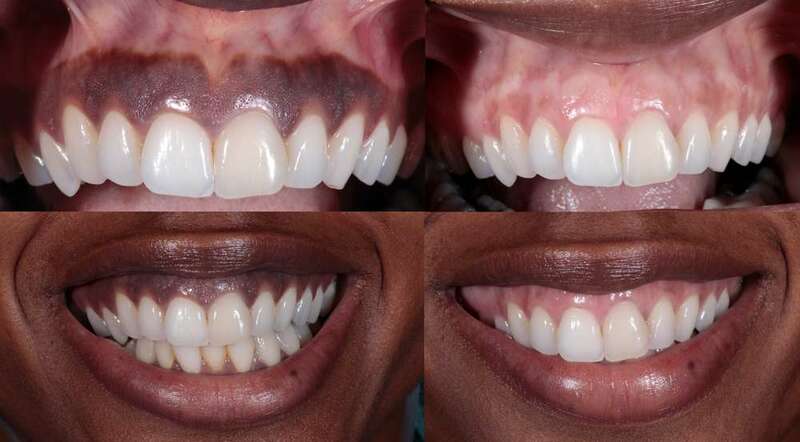 A gum depigmentation procedure can be performed using several techniques, and successfully removes the dark spots on the gums caused by excess melanin. The treatment results in healthy looking gum tissue, and will reveal a more attractive smile that will have you showing off your full beautiful smile with excitement! Typically, healthy gums should appear pale pink in color. However, people with darker complections may experience a brown shade on their gums, due to their natural extra melanin production. Some people are born with darker gums, as it is a genetic component, while others may experience changes in gum tissue color as a result of varying factors. Because these changes may be indicative of prominent underlying issues, it is imperative to be aware of changes in gum tissue color, and see a periodontist if you notice changes in color. Changes can include dark spots, brown spots, or patches. Dark spots on your gums can be caused by several components. It is important to see an expert periodontist in Los Angeles to properly diagnose and treat your issue, as it may be a sign of a larger health complication. Normal, healthy gums are light pink in color. Due to factors such as complexion, the body’s natural melanin production or genetic components, gum pigmentation may appear darker. Most commonly, dark gums are caused when a person’s body naturally produces more melanin. This will create an overall darker appearance of the gums. However it is important to differentiate between darker gums, and dark spots or patches that may appear. See below for how to know when you have dark gums, and the potential causes. Gum pigmentation manifests differently for every patient. Some people notice small, dark spots on their gums, while others experience vast black or brown patches. Depending on what you’re experiencing, Dr. Aalam and Dr. Krivitsky will create a personalized treatment plan focused on your unique case. While pigmentation is not medically dangerous, many patients feel that the condition is aesthetically displeasing, and opt for this procedure to help restore their confidence. Gum depigmentation is a simple, minimally invasive treatment that can help you achieve the healthy-looking smile you desire. A number of factors can contribute to gum pigmentation including genetics, poor dental hygiene, which can also lead to periodontitis, also known as periodontal disease, smoking and/or the extended use of certain medications. Although anyone can suffer from gum pigmentation, people with darker complexions tend to naturally possess higher levels of melanin which in turn can result in a darker shade of gum tissue. Dr. Aalam and Dr. Krivitsky utilize advanced technology to treat gum pigmentation in Los Angeles, at their Brentwood periodontal practice. Using only the most cutting-edge equipment available, they perform a state-of-the-art microdermabrasion technique to remove the pigmented areas of the gum, to reveal the healthy, lighter-colored tissue beneath. One of the benefits of this form of treatment is that it affords the periodontist higher accuracy and control in removing pigmentation, so the resulting gums appear natural and healthy. Our patients achieve flawless outcomes of lighter, more attractive gums after surgery, as well as increased confidence because they love their new smiles! This minimally invasive technique that Dr. Aalam and Dr. Krivitisky use to perform gum depigmentation treatments in Los Angeles targets the surface of the gum tissue to expose the lighter colored underlying gum tissue. This procedure is similar to the microdermabrasion technique used in dermatology that successfully removes the upper layer of skin. Once the uneven and dark layer of the gum tissue is removed, the new tissue revealed is lighter in color and more natural looking, creating a more uniform pink color of the gums, to achieve a healthy smile. The procedure is fairly simple, yet extremely effective in brightening patient’s smile and restoring healthy looking gum tissue. The microdermabrasion peels away the surface epithelium and melanocytes to expose the underlying connective tissue, which will induce pink and firm kératinized tissue. Dr. Aalam and Dr. Krivitsky possess unique expertise in periodontal corrective treatments. If you experience dark gums, or are unhappy with your smile, allow Dr. Aalam and Dr. Krivitsky to help restore your oral health, and improve your confidence when smiling! Our patients achieve flawless outcomes of lighter, more attractive gums after surgery, as well as increased confidence because they love their new smiles! The minimally invasive treatment helps patients achieve a beautiful, healthy-looking smile, with little post-operative pain or discomfort. Utilizing cutting-edge technology, Dr. Aalam and Dr. Krivitsky offer gentle, effective care, that help patients improve their smile, without painful treatments or extended recovery times and leaves patients with natural, aesthetically pleasing smiles. Some general discomfort is expected immediately following the surgery, however patients do not experience any extensive pain during recovery. Patient’s can expect to return to normal activity the day after treatment. After undergoing gum depigmentation, patients may experience some discomfort and sensitivity in the gums. However, most people find that over-the-counter pain medications offer effective relief. The rate of success for this periodontal treatment is very high, and most patients achieve the more attractive, lighter-looking smile they desire. Our goal is to ensure all patients enjoy a gentle and painless dental experience. Q: How do I know if I’m suffering from gum pigmentation? A: Gum pigmentation manifests differently for every patient. Some people notice small, dark spots on the gums, while others experience vast black or brown patches. Q: Are dark gums a medical problem? A: While pigmentation is not medically dangerous, many patients feel that the condition is aesthetically displeasing. Gum depigmentation can help you achieve the healthy-looking smile you desire. Q: What will my gums look like after this periodontal surgery? A: After undergoing gum depigmentation, most patients find that their gums are lighter and more consistent in color, without dark spots or patches. Q: What Causes Dark Gums? A: A number of factors can contribute to gum pigmentation including genetics, poor dental hygiene and smoking. Although anyone can suffer from gum pigmentation, people with darker skin tend to have a greater risk of experiencing melanin buildup. Certain medication also contribute to gum pigmentation. Are you in need of fixing your gum pigmentation? Contact us today for a consultation with Dr. Aalam or Dr. Krivitsky to discuss the best treatment plan for you!